The National Association of School Psychologists (NASP) has set standards for the provision of school psychological services for over 30 years. Despite this long-standing guidance to states and local school districts, school psychologists' roles and practice vary significantly across the country. 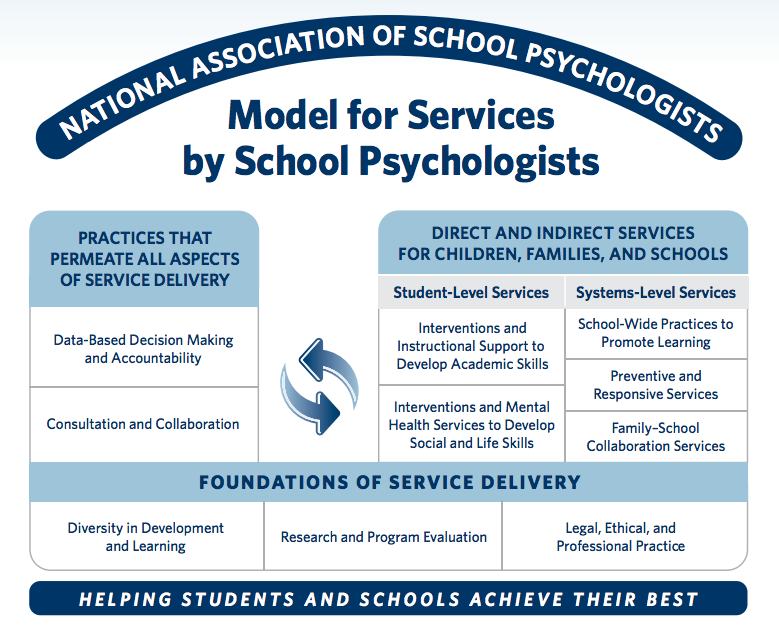 In March 2010, NASP approved a formal model of practice designed to improve the consistent implementation of school psychological services to help ensure their maximum effectiveness, efficiency, and quality in schools nationwide. These resources can help you promote the NASP Practice model and your role in providing comprehensive school psychological services to key stakeholders and decision makers in the school community. This brochure provides an overview of the NASP Practice Model, highlighting critical information. This webinar gives an overview of resources to help states implement the NASP Practice model, including an examination of the NASP Practice Model Implementation Guide. This PowerPoint presentation provides an overview of the NASP practice Model and its importance to the profession of school psychology. Referencing the NASP Practice Model in professional development presentations helps decision makers see how the model supports district/school priorities, services and outcomes. This Advocacy Roadmap will provide individuals and state associations with some key materials and resources to plan an advocacy response within the context of the NASP Practice Model. This handout provides a sample framework around which schools and districts can work to embed the principles of the NASP practice model in the evaluation of school psychological services. This handout contains key messages about the value of school psychologists and the services they provide. This article from Communiqué handout contains key messages about the value of school psychologists and the services they provide.